Louis Pito limps in from early position, and John Shin moves all for around 70,000 from middle position. 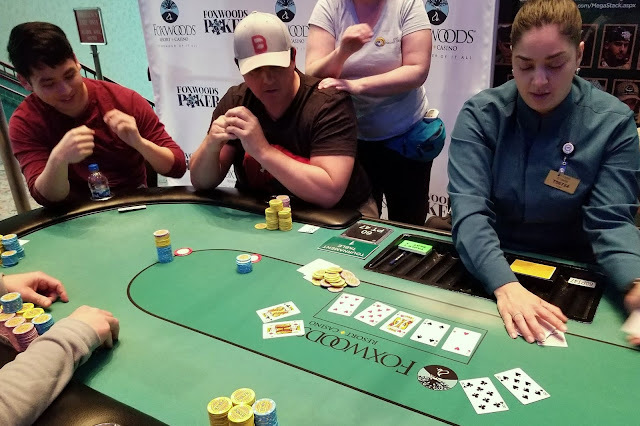 Billy Pappas moves all in over the top in the hijack, and it folds back to Pito who flashes his neighbor A♥7♥ before tossing them into the muck. The flop comes K♥4♠2♥, and Pito tells the table that he folded the ace high flush draw. The 8♥ turn gives Shin a set, but leaves Pappas in the lead. "That would have been a very interesting turn," a player at the table says to Pito about his mucked flush. The river is the 6♥, and Shin is eliminated in 61st place.